In our latest in a series of ‘Better Business’ webcasts, Panacea Adviser is delighted to team up with Glassagh Consulting to produce a FREE ‘Bento for One’ webcast to support and educate advisers. The way in which we communicate with friends, family and businesses has changed forever. We are now in the age of the instant like, dislike, friend and unfriend. An age where recommendations on your service and proposition are shared and discussed on social media such as Twitter, Facebook and LinkedIn. How prepared is your business to promote your proposition in the digital age? 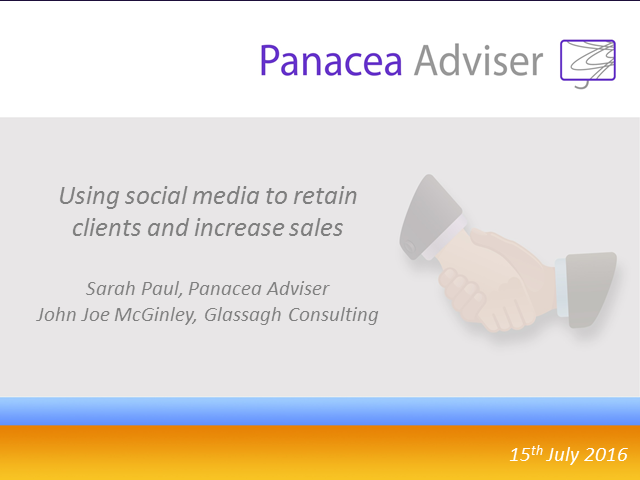 John Joe McGinley from Glassagh Consulting and Panacea Adviser will outline in their next Bright Talk session. This webcast will cover 10 ways in which every business, large or small, can effectively use social media to promote their proposition, communicate with clients and increase sales and client retention.